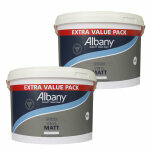 Albany Matt is a low VOC content matt finish. It is a wipeable product which is thinned with water and is applied by brush or roller. Albany Matt is suitable for interior use. Touch dry in 2 hours and recoatable after 4 hours. All surfaces must be clean and suitably dry. Powdery, polished plaster or dense surfaces should be primed with Albany Primer Sealer. Porous surfaces should be 'mist' coated with Albany Vinyl Matt Emulsion thinned with up to 20% clean water. Organic growth must be removed and the areas treated with Albany Fungicidal Wash.